The Aielund Saga makes use of CEP. You will need that and its tlk table file. Thank you, but I tought the ee version had CEP already in it. Isnt it? No, it doesn't. You'll have to install it separately. Oh I had that explained to me a little while ago. Not too difficult really! So the folder name on your hard drive with all the files has to match the name of your workshop item. I had c:\AielundSaga initially, but then changed the final name on the workshop, so when it came time to update it, I had to change the folder name to match the online version, which in this case was c:\The Aielund Saga Enhanced Edition. Then you just use WorkshopUpload within the client like you initially did, and it'll only upload changed files from that directory. It's in the Steam Workshop alongside Aielund. In fact, when you subscribe to Aielund in the Steam Workshop it tells you which other workshop mods are required. This is the first module i've played since well over a decade. So far i'm loving it! I downloaded it on steam and am making my way through chapter 1. I love the rain ambience hehe. Yes I found the area transition is incorrect. I'm uploading a fix to the vault but for your game, you can use the stone of recall if you have it and haven't reset it's recall location (should take you right back to the centre of town). I'm using Real Skies Lite this time, so I think the full HD version of Real Skies might be what was causing the crashing problem. @Savant1974 , I've encountered an early scripting problem in The Dockmaster Mystery in Part One. I bribed Luther to point me to Black Pete. When I talk to Black Pete, he just says "What are you doing here? ", and my only response option is "Just nosing around." To which he basically replies "Well, get lost, nothing to see here," and that's the end of it. I'm pretty sure I'm supposed to have options to start questioning him about the dockmaster's murder. So, I just can't finish the quest. I might be able to force it through by attacking him, but I don't want to do that. So for the time being, I'm just going to assume it's a dialogue tree error or a scripting error and let it go. I'm liking the enhancements and the Player Tool One being included. Everything looks really good. BTW, I'm using the Steam version. That should get you back on track! In other news, I've signed a deal with a small US publisher for my novels Yes, this means I won't be doing new nwn stories I'm afraid. @Savant1974 , Congrats! That's marvellous news! I found a minor issue with a weapon. I'm not sure if it's from the module itself or from a weapons hak that somebody else made. I bought Nelise a +1 heavy mace from the blacksmith in Culdeny. When I tried to cast Flame Weapon on Nelise while she's holding it, the game says "spell failed, must be cast on a melee weapon or a character holding a melee weapon." So, it isn't recognized by the game as a melee weapon for some reason. I had to take it back and get her a +1 morningstar instead, even though the transaction lost me close to 1,000 gold. Flame Weapon works appropriately with that. I know the one-handed heavy mace is some kind of hak or override, as that is not a weapon in the base game. It's not too big a deal. Now I know to stay away from that weapon in the future, as Flame Weapon is a major part of my combat strategy with both mages and clerics. That would be a CEP weapon (there are quite a few of them in the game). They're lovely but real pity that they don't work like normal base weapons. Does anyone know where I can find a list of spell descriptions that @Savant1974 uses for Aielund? There's a lot I like about it, but it changes the duration and behavior of a lot of spells, and it gets frustrating sometimes not being able to go by what the spells say they do, which they often don't in Aielund. Are the spells custom designed for Aielund, or is that a hak that other modules also use? Does anyone know other modules that use the same spell system? One thing I really, really like about it that I wish I could install into the OC's is that I can cast a buff on myself, and my familiar or animal companion automatically gets the same buff. It's the EMS hak. There should be a text file with information about the changes that goes along with it, though it's a bit of a chore to read through. That’s right, and it’s because the Heavy Mace isn’t a base game melee weapon. It’s a new baseitem added in a hak (e.g. by CEP). There are a number of base game features ( e.g. the Flame Weapon spell) that actually enumerate the base item types they can apply to. If you add a new one, it won’t be in the list and won’t work. I solved that in Sanctum of the Archmage by editing those features (e.g. spell scripts) to also check for a variable on the item that effectively added it to the list. Then all that was necessary was to set the variable on any item blueprint I wanted to make sure the feature worked for. That was a much better solution than trying to statically enumerate all the possible baseitem types. No, going at it all wrong. Just write a custom function that check the baseitem.2da there certain marking all melee weapons standard and custom ones. I be updating my base so it does this. update: Done will be in next update. I thought I already did these oops. No, going at it all wrong. Just write a custom function that check the baseitem.2da there certain marking all melee weapons standard and custom ones. That's an interesting approach. To make that work you'd probably want to check the item's weaponwield value for 0, 4, 8, or 9. You'd still have to end up editing the same scripts, though. That's because the way the game checks for this now is with include functions (like IPGetIsMeleeWeapon in x2_inc_itemprop) that enumerate all of the eligible baseitem ids (BASE_ITEM_BATTLEAXE, BASE_ITEM_KAMA, etc.). You'd need to either augment or replace that with the result of the 2DA lookup (as I did with an item local variable check). And you'll need to bring any spell scripts you want to be affected by the change into your module resources, or they won't re-compile on build. That's also assuming that this is your intended behavior, of course. CEP Flowers, for example, have weaponwield=0. Should Flame Weapon work on them? That actually might be kind of cool, but it also might not be what you want. 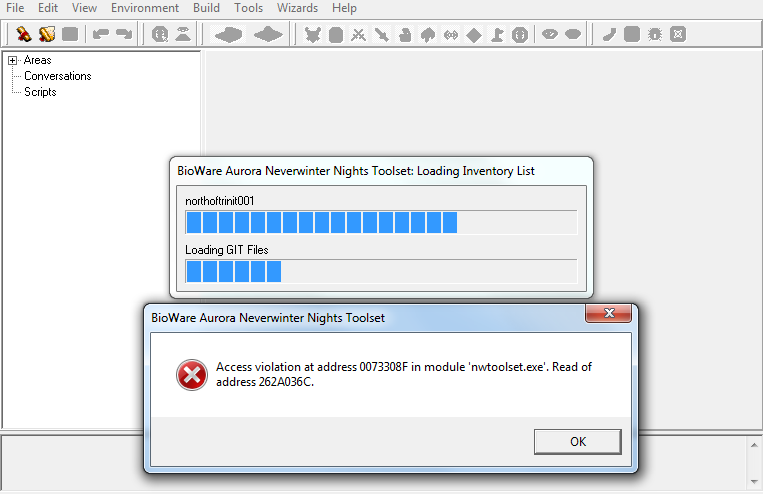 (This may be why Bioware went with script enumeration in the first place.) Using blueprint variables does give you a bit more fine-grained control over that, which I wanted. You just do a dice damage check, we know it does damage, then you do a range weapon(thrown weapons return range too) check. LOL so no unless your flowers have a base damage LOL. I already moved over all spells in routing system so updating them is easy (two scripts for all spells to save on space). If you want the code, we can continue this in the scripting forum or CC forum. While played on EE, Act 4 Part 2 crashes at the end of Part 1 or when I try to start a new game via main menu. The "Unpacking Module" screen shows up for a couple of seconds before the crash. Part 3 works fine. I deleted the currentgame folder in case the file there was corrupted, but that didn't help. I've installed CEP 2.65, so I might try to roll back to 2.60 and see if that has any effect. The latter address code changes every time, but the former (0073308F) is always the same, as is the part where I get the error (Loading Inventory List --> northoftrinit001 / Loading GIT Files). //Edit. I read that EE doesn't play nice with Intel CPUs, but in case it's relevant for troubleshooting, I'm using a Phenom. I just finished part 1. It has been a few years since I have played so there were many changes I noticed. Great job on all the work and thank you for the updated versions. I did notice a few minor bugs that you may want to know about. None are real problems but I thought I would post them. 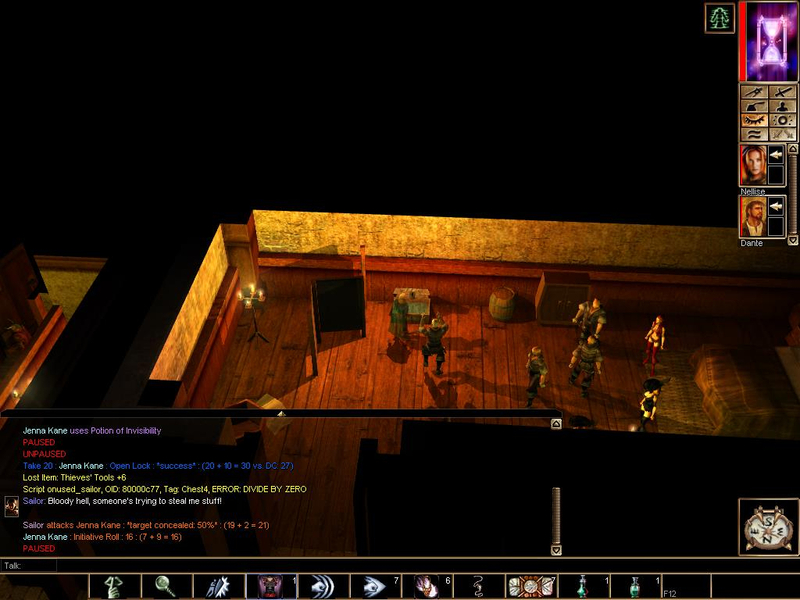 The party at the inn has a bug with the chest. Everyone goes hostile at the party if you try to open the chest no matter how you try to open it. Invisibility and hide do nothing. There appears to be a script error and I will post the screenshot of the error. The conversation with Tom Ballard where he tells you his name after the delivery has a problem. At the part where he is about to tell his name it jumps to the end of the conversation. Also his store will not open. Kipper Bob still thinks you have not found the body if you talk to him after giving him the body. He does give the correct dialog when you give him the body but the journal mentions that the body has not been found. This may not be a bug but Luthor never offers his store. I was playing a LG Monk so that may be the reason. Last the ee version now allows you to chose Wemic and Brownie as PC choices. Not good for new players. If anyone else is having trouble with Act 4 Part 2 v3.10, v3.08 works fine for me. The file is still available in the Vault if you copy the download link for v3.10 and change its version number. Weird that something happened between those versions to mess something up for some people but not others. Ugh. I remember playing and enjoying this module series years ago. I look forward to the finished update for EE to relive the adventure! I went to Amazon to buy the 6 paperbacks and they are listed as either out of stock or out of print. Will you be having copies for sale anytime soon? I would like to read them after finishing the series.